The route to savings for your business starts here. 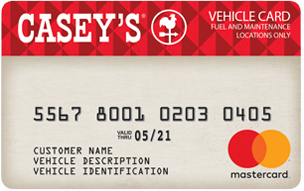 The Casey’s Business Mastercard® isn’t just a gas card, it’s a robust fuel management program. A program that provides the control, savings, and convenience your business needs. Experience complete online control 24/7! The Casey’s Business Mastercard provides fleet managers with detailed reporting, individual spending controls, and acceptance at over 2,000 Casey’s General Store locations in the United States. In addition to Casey’s locations, the Casey’s Business Mastercard also gives your drivers the flexibility to pump at any other fueling location in the United States where Mastercards are accepted. When you use the Casey’s Business Mastercard at Casey's General Store locations, your business will save up to 6¢ in rebates per gallon on gas and diesel fuel. These exclusive rebates make the Casey's Business Mastercard the smart choice for your fuel management needs. When the Casey's Business Mastercard is used at a fuel station, prompts are required prior to each purchase. This data allows for a detailed tracking of vehicle and driver purchasing behavior. The Casey's Business Mastercard program provides access to the reports and information you need to manage your fuel expenses efficiently, helping you reduce the amount of time spent on administration. The Casey's Business Mastercard can be tailored to your business needs. You can set prompts to ask for vehicle or driver number prior to purchase. If needed, cards can be shut off at any time. Get secure online access 24/7 to transaction data, card and driver ID information. Account must be in good standing to receive the rebate payout. Rebates will be reflected on your billing statement in the form of a statement credit. Not valid on aviation, bulk fuel, propane or natural gas purchases. Rebates are subject to change at any time without notice. Terms and conditions apply. To view the full product Terms and Conditions visit https://fleetbusinesssolutions.com/caseys/terms.